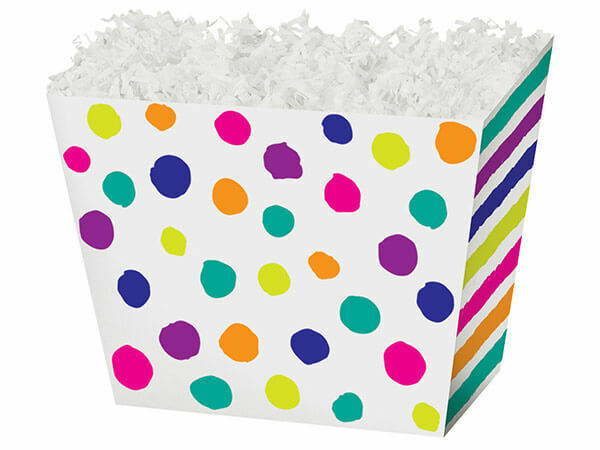 Large Painted Dots & Stripes Angled Basket Box 10-1/4 x 6 x 7-1/2"
Large Painted Dots & Stripes Angled Basket Boxes coordinate well with our C18BC Cello Bags and GBB2B Poly Basket Bags. Angle shaped basket boxes for all occasion gift baskets. Sturdy reusable themed basket boxes store flat and are a unique and inexpensive alternative to bulky gift baskets. They also make great table centerpieces for parties.